We had our Ward leadership Christmas party this weekend, and one of the things that everyone looks forward to is the white elephant gift exchange. It’s always fun to see what craziness people come up with. 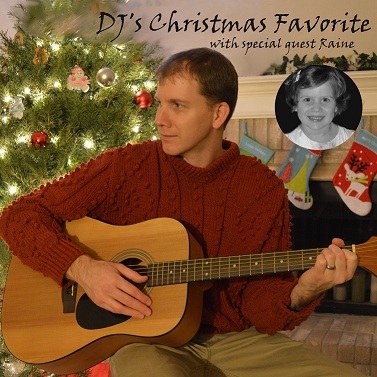 Kim was looking up ideas for white elephant gifts one night and came across a suggestion to record your husband singing some Christmas songs, take a picture of him in a cheesy Christmas sweater and make it into a CD. Since I have become so well known in our ward for one particular Christmas song, I thought it would be funny to use that idea for my gift. This is what we came up with. It certainly produced some laughs when it was opened. Ha ha ha! Could you mail me a copy? That would be perfect for Santa to put in Craig’s stocking! That is great — I love it!! Raine you were a spectacular guest artist — good job! You were good too, DJ! love it! That is hilarious!! Love it. My kids were singing along. If you’re going to be famous, that song’s a good reason. Love the cover artwork!!! Was it one of the gifts that was traded around or hidden and held on to?